Our route -- in blue. So what do you do after you release a book? Well if you’re me, you set off on a road trip to research your next book. And that’s exactly what’s happening this week. On Wednesday Charles and I will hit the road on a five-and-a-half week press trip. Yep, you read that right. And along the way we will be looking at unique accessible lodging options to include in my next book, as well as material for Emerging Horizons. It really looks like a great itinerary, and it even starts off with a speaking engagement at Mercy San Juan for the Sacramento MS Society. From there we will head east through Nevada, and hopefully miss the newly fallen snow in Eastern Nevada. Then it’s over to Utah and Colorado and on to Kansas, Missouri and Arkansas, before we hit Nashville for a much needed day off. I have big plans there, and will meet up with a friend from high school (who lives there), and a travel writer friend (who I guilted into coming there to visit me). After that it’s up to Indiana to pick up a shawl from my favorite weaver, then east to Ohio, West Virginia, Maryland and Pennsylvania. After we ferret out a good trail of quilt barns and covered bridges we’ll head up to Newport for a few days. From there it’s over to Massachusetts, upstate New York and then over the border to Quebec province. After traveling through Ontario we will pop back into the US in Michigan and explore the UP before heading over to Minnesota, South Dakota, Wyoming and Idaho. For our final leg, we’ll spend some time in Baker, Nevada, then head over to the Eastern Sierras for a short trek to Bodie and the Bristlecone Pine Forest. Then it’s over Tioga Pass and on to home sweet home. So that’s it in a nutshell. And of course Cherry is coming along with us. I will be updating our progress here and on Facebook, so stop in now and again to see what we’re up to. Here’s to a very accessible, successful and tornado-free press trip! 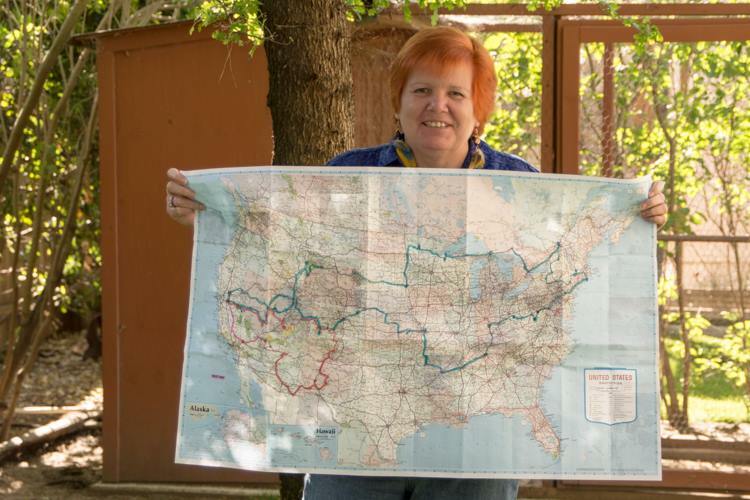 This entry was posted in Road Trips and tagged accessible, barrier-free, Candy Harrington, car travel, disabled, road trip, travel, vacation, wheelchair by Candy B. Harrington. Bookmark the permalink.